On the last day of the workshop, Karen worked with Federico and Janet to complete her tapestry, a glorious rainbow of red, warm yellow and orange, cream and blue. 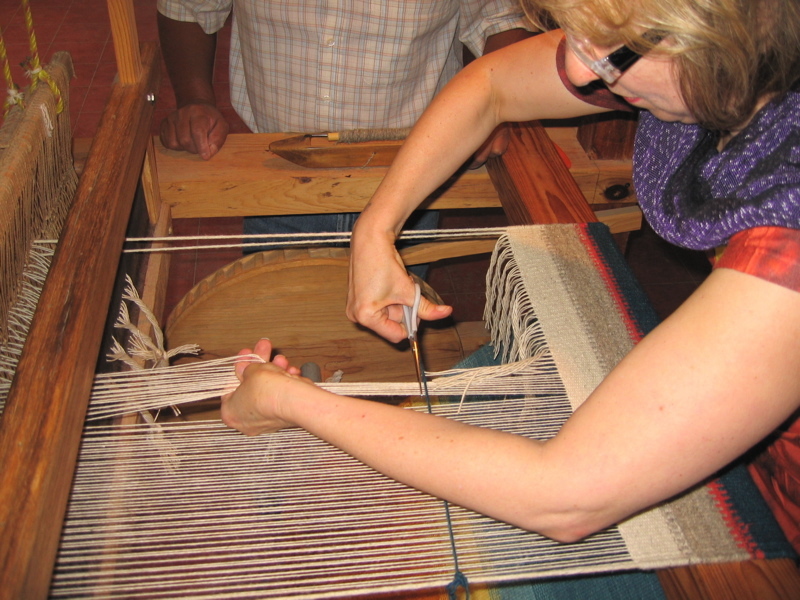 She cut the piece she will use for a wall hanging off the loom, and learned how to finish off the rug in the traditional Zapotec technique of rolling the warp threads into fringes and then tying them off. As an instructor with her father, Janet Chavez Santiago had this to add about the four-day experience: It was a great experience for me to do the workshop with Karen. 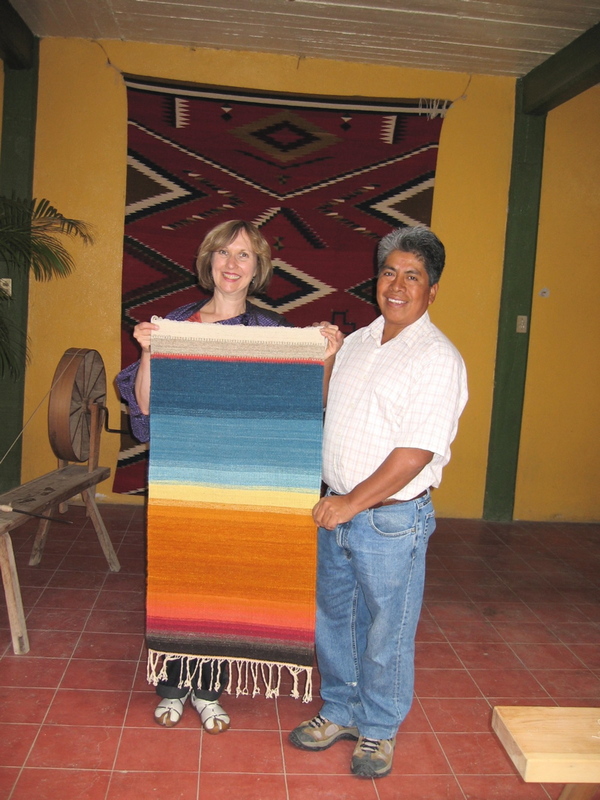 It was very satisfying to see how she learned and how she was able to create a beautiful finished product — her rug! The dyeing day was perfect. Karen said she appreciated the process of our work and how we take the time to dye the wool by hand using natural materials. I was very happy that I could teach her the mordanting process, and dyeing with acid, alkaline and a neutral base. The indigo was a challenge because it is a difficult process, but we did it and without mistakes and she was able to see the different blues and how the color changes when it comes in contact with the air. I am very excited about the next workshop we have scheduled to start on August 11. It’s full with five people and it’s going to be wonderful, too. We are now accepting reservations for workshops starting November 22 and December 13. 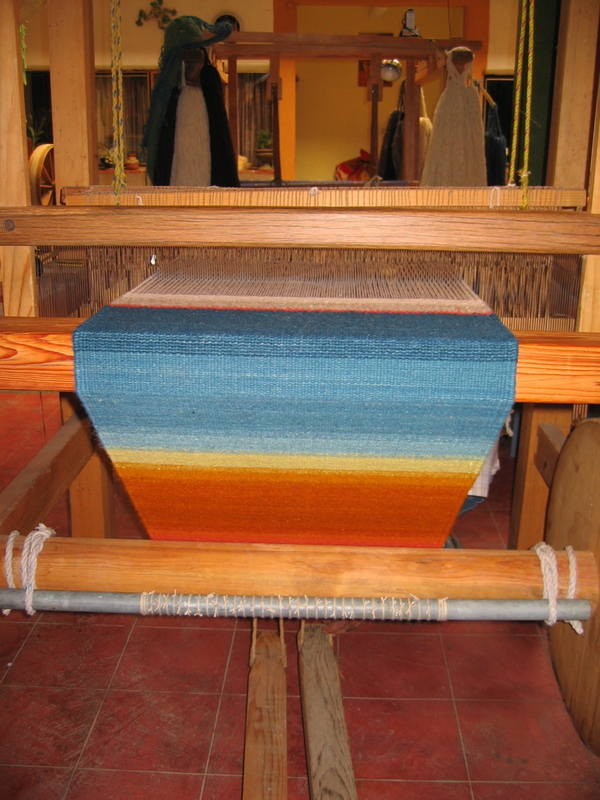 See the website or blog post: Oaxaca Weaving Workshop: Dancing on the Loom, for more details.